In this Ableton Vocoder tutorial you will see how you can create a growling bass sound from scratch, using the external routing feature in Ableton’s vocoder plugin. 1. Ableton Operator (any synth will do, but Operator can create some very growlly sounds using FM synthesis). 2. 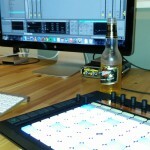 Ableton Sampler (Ableton Simpler will also work, but will have less features and sonic possibilities). We will be using two midi tracks for this sound. In the first midi track, load an instance of Ableton Operator (or any synth you want to use). In the 2nd midi track, load an instance of Sampler to begin with. Next, find a vocal sample that you would like to use and drop it into the sampler. I like to use a 2 syllable word from a rap acappella, that has a lot of intonation in the voice (pitch goes up then down for example). Use the loop start and end points to isolate the start and end points of the phrase you want to use in your sample. You may want to loop it. There is also a forwards and backwards sustain mode in Ableton Sampler, which will play the sample forwards, then in reverse, and continue repeating until the midi note ends. First, we need to change the routing of the vocoder so that it is taking audio from the first midi track (the one that has our synth on it). To do this, change the carrier chooser from ‘Modulator’ to ‘External’ and then make sure the ‘audio from’ chooser is set to the midi track that has your synth on it. In the picture above you can see some example settings that you may want to experiment with. You can see that the range is set from 120 Hz to 18 kHz. This is important, because we don’t want the vocoder acting on frequencies below around 120 Hz. It usually doesn’t sound good. In fact, we will add in a separate sub bass later on in this tutorial. Another important setting is the bandwidth. By default it is set to 100%, but you often need to boost this up so that you get a fuller sound. You may also need to increase the level in the vocoder, as it reduces the overall level a lot. The number of bands is also an important thing to play with. I find that 8 or 12 bands can work well for basses, depending on the sound you are going for. The magic dial is the formant shift on the right of the vocoder. By automating this, you can get some great vocoderish goodness into your sound. 2. Draw a note into a midi clip and inside the midi clip, click on E in the bottom right corner, so that you can draw automations of different parameters directly into the midi clip itself. Next, automate the volume level of operator B so that it changes over time during the duration of a note. 3. Now you can experiment with different waveforms, and also change the course tuning on operator B to see how it affects the sound. Perhaps another triangle waveform will work well. Perhaps a sinewave with some extra sine harmonics would work well. Try it out and see what you like. 4. You can add some extra frequency modulation (FM) by increasing the level of operators C and D if you like. Smaller volume levels work well for these I find. 5. Next, deactivate this track that has your synth on it. We won’t need it as it will be heard coming through in track 2 with the vocoder and sampler. 6. Copy the midi clip from track 1 into track 2 and play both clips at the same time. We need midi notes to be the same on both tracks. Select the sampler and vocoder and press ctrl G (cmd G on Mac) to group them into one instrument rack. Next, click on the show / hide chain list button on the left side of the instrument rack. You will now be able to drop a new instance of a synth (possibly Operator) into the chain list. This can be just a pure sine wave. To make sure it is a sub, make sure that it is peaking at between 40 and 60 Hz when you play the root note of your main bass (I recommend notes E to A for the root note of your track so that the sub can be heard the clearest). To thicken up the sub a bit, I like to use the soft shaper, which can be found in the filter tab of Operator. This mild distortion adds some faint harmonics above the sine wave’s fundamental frequency, which can help to make it heard on smaller speaker systems. If you don’t know how to use Multiband Dynamics properly yet, I will do a tutorial on it soon. You can see how I use it in this tutorial in the video above. A few instances of overdrive with mild drive and dry / wet settings can help to add some extra harmonics to the high frequencies in the mid bass, which can be lost with the use of a vocoder. Some saturation can also work very well to warm up the sound a bit. From here on it is just a case of tweaking all of your settings, especially the automation of operator B in track 1 and also the formant shift in track 2. In the video above I give you some extra tips for working with this sound, such as pitch envelopes and FM modulation inside the Sampler plugin. If you enjoyed this tutorial you may want to check out some of our courses on sound design and other topics here on the site.